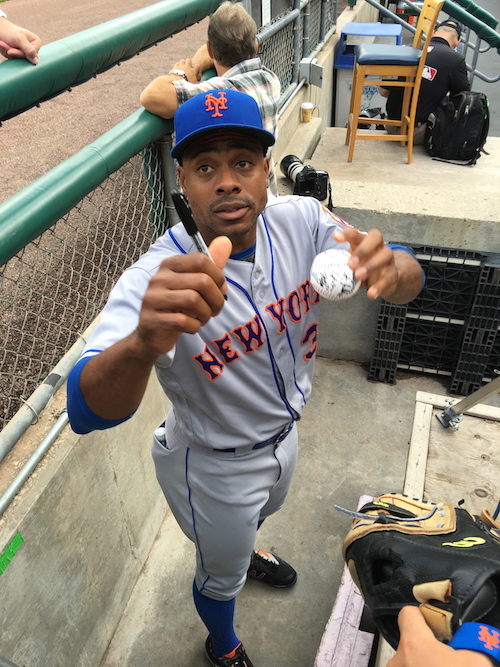 Here is an original photo of Mets outfielder Curtis Granderson signing autographs before a recent Mets vs. Tigers game at Comerica Park in Detroit. The shot was provided by Lance Martinez of My Detroit Sports. Granderson is in his 13th MLB season and third with the Mets. The Illinois native started his career with the Tigers, later playing for the Yankees from 2010-2013. Prior to the 2014 season, Granderson moved from The Bronx to Queens upon signing a free agent deal with New York’s National League team. The 35-year-old is a three-time All-Star, with career marks of 285 homeruns and 780 RBI. This season, Granderson is hitting .223, with 22 HR and 38 RBI. Mets fans can also view an iFolloSports.com original article, featuring video of Granderson signing, earlier this season at Citi Field.